Video Appears To Show Tourists Destroying Popular Oregon Rock Formation : The Two-Way The sandstone pedestal in Cape Kiwanda was fenced off, but visitors often slipped past to take photos. A video shows people pushing on the rock. There's a shout of "Got 'em!" as the formation falls. This rock formation at Cape Kiwanda State Natural Area — shown in October 2008 — was apparently destroyed by vandals. The sandstone pedestal, which was found in pieces last week, was roughly 7 feet to 10 feet across and located in a fenced-off section of the park. 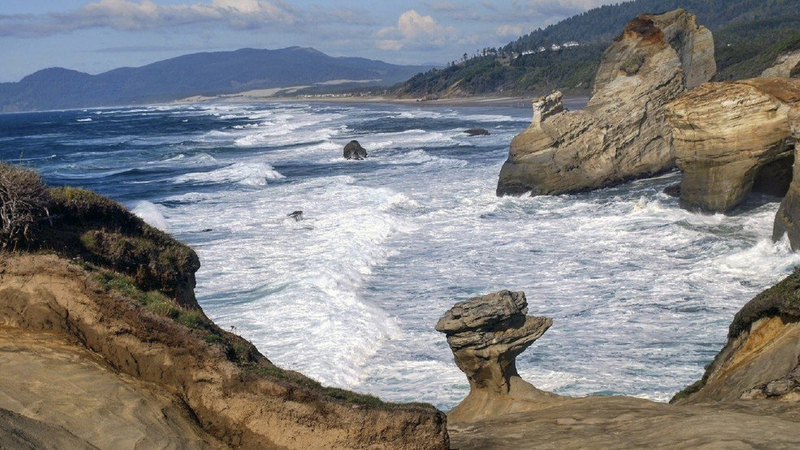 When the iconic sandstone formation known as "the duckbill" collapsed, the Oregon Parks and Recreation Department wasn't suspicious. Erosion happens. Rocks fall. The stretch of cliff where the formation was located, in Cape Kiwanda State Natural Area, was so unstable it was fenced off to keep visitors away. There seemed to be no mystery: The 7- by 10-foot pedestal on the coast probably collapsed on its own. Then a man named David Kalas said it wasn't time and weather that brought down the rock. It was vandals. 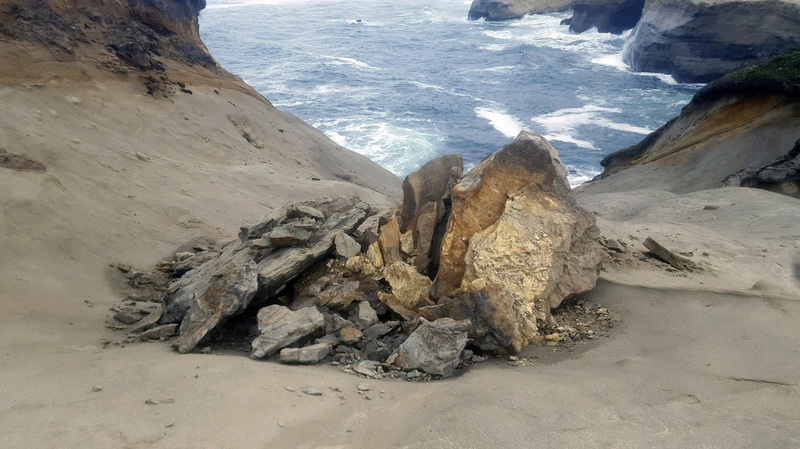 This undated photo provided by the Oregon Parks and Recreation Department shows a natural rock formation that was found in pieces last week at a state park in Pacific City, Ore. Oregon parks officials originally said they did not think the break was caused by humans, but cellphone video captured a group of people apparently knocking over the popular sandstone formation. Kalas told The Oregonian that when he saw a group of strangers messing with the formation, he was laughing instead of alarmed. But then he saw it start to wobble, and he hit record. His footage — which we should note includes one expletive — appears to show a group of people gathered around a pedestal rock formation, pushing and pulling on the rock. When it comes down, a voice is heard shouting, "Got 'em!" Kalas told KATU News that he spoke with the people who he says brought down the rock in the fenced-off section of Cape Kiwanda. "I asked them, you know, why they knocked the rock down, and the reply I got was: their buddy broke their leg earlier because of that rock," Kalas told KATU. "They basically told me themselves that it was a safety hazard, and that they did the world or Oregon a favor." The Tillamook County Pioneer news site published a statement from the Oregon Parks and Recreation Department, saying the department and the state police are reviewing the video and determining how to respond. "The department takes vandalism of a state park's natural features seriously," the statement reads. Anyone who helped bring down the rock might face a fine of up to $435, the Statesman Journal newspaper reports. And whether or not that was hard on the formation, it was definitely risky for the rock-clamberers. In fact, the Statesman Journal reported just a few months ago on the dangerous allure of the rock. A picture atop the now-collapsed pedestal was "one of the most sought-after images" of the Oregon coast, the paper wrote in July — but getting the shot required evading that fence and crossing to a perilous bluff. "Seven people have died in the area since 2009. Six fatal falls have taken place during the past two years. Rescue efforts by the local fire district and U.S. Coast Guard cost upward of $21,000 per hour, often topping out near $106,000," the newspaper wrote. "Yet people continue to flood past the fence and signs. Adults, teenagers, grandparents, photographers and even parents with small children disregard the warnings." A park ranger was assigned to patrol the fence, but "combating the allure of that perfect picture — that happy couple perched on a natural pedestal above the ocean — will be no easy task," the Statesman Journal wrote. But now the perfect photo is impossible — raising a question. Might vandalism succeed in keeping visitors away, where safety warnings failed?